Three Years In, Might the Dyckman Bike Path Finally Get a Hearing? It’s been over three years since residents of Inwood first proposed a separated bike path for Dyckman/200th Street, one that would link Manhattan’s east- and west-side Greenways and help foster a safer and more humane environment for neighborhood cyclists and pedestrians. So persistent are advocates of the project, known informally as the “Dyckman Greenway Connector,” that they persuaded the notoriously auto-centric Community Board 12 to ask DOT for a feasibility study. That was in late 2008. Since then, things haven’t moved an inch. According to DOT personnel, an analysis of the connector was to be included in the Sherman Creek-Inwood traffic study, unveiled in the spring of 2010. However, though it outlines a number of planned improvements — including what looks to be a significant redesign of the hellish interchange at Dyckman, Broadway and Riverside Drive — the study makes no mention of bike infrastructure, on Dyckman or anywhere else. “It is hard to understand how the DOT decides to put in protected bicycle facilities in some neighborhoods but continues to deprive Inwood of any such facility, and declines even to study the Dyckman Greenway Connector,” says Maggie Clarke, longtime Inwoodite and a chief proponent of the plan. To Clarke’s point, it’s difficult not to notice the fact that Inwood joins East Harlem among Northern Manhattan neighborhoods to explicitly, and to this point unsuccessfully, request the city’s help in improving cycling conditions. 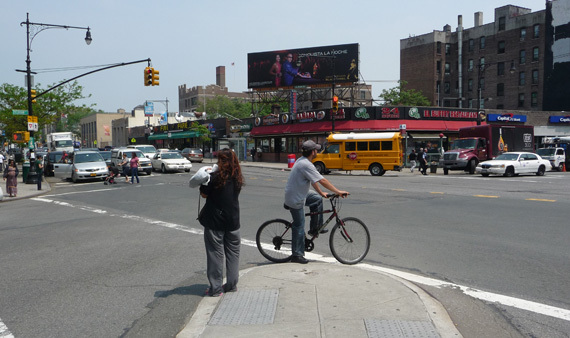 A traffic island separating Dyckman from Riverside serves as a cyclist and pedestrian refuge -- sometimes. Not that there is any reason to believe whatever DOT may someday come up with would get the blessing of CB 12. The full board did pass a resolution requesting a study — but the transportation committee did not endorse the concept, and committee members loaded the reso with conditions. The transportation committee has also repeatedly stalled discussion of the project. 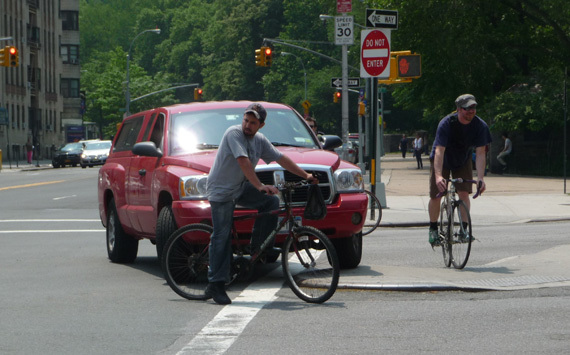 Last November, it abruptly canceled a scheduled hearing on district bike facilities, closing the agenda to advocates who were poised to present hundreds of signatures in support of safe cycling infrastructure in Northern Manhattan. The committee then said it would not reschedule during the winter, as cold weather would suppress senior turnout. Finally, a CB 12 bike forum was set for June 16, where safe streets backers hope to make their case. Just to keep it interesting: A DOT spokesperson told Streetsblog that CB 12 asked the agency to consider the Dyckman lane separately from the Sherman Creek-Inwood study. But like everyone else, the agency is waiting for the June forum, where, the spokesperson said, “we plan to discuss bike facilities for the neighborhood” with the community board. Streetsblog will have more details as this elusive event draws closer. “The committee then said it would not reschedule during the winter, as cold weather would suppress senior turnout.” Safety is not seasonal. Doesn’t matter if some people don’t want to come out for a winter hearing; cold weather is no excuse for denying much need traffic calming.